A little bit off the Mur River Valley just north of Judenburg, you can find the small towns of Oberzeiring and Oberwölz. Austria has plenty of places where mining took place - just as you would expect it in an Alpine country. Hall and Schwaz in Tyrol, Hallein near Salzburg, the Salzkammergut area and the iron mining in the Eisenerz / Leoben area are the most famous ones. Oberzeiring and Oberwölz are somewhat neglected. They are off the beaten track of most international tourists, but this actually adds to the flavour of these ancient towns. In terms of landscape, the scenery by itself would justify a short stay: Just by the eastern outskirts of the Tauern mountain range and in a pretty valley, one would not expect to find one of Austria′s most significant contributors to early industrialisation. Nevertheless, Oberzeiring played a crucial role in the country′s economy in the Middle Ages and is responsible for the wealth of Judenburg′s merchants. This was due to silver mining, which continued until the 17th century. Iron ore was quarried for even longer and therefore, mining continued until well into the 20th century. 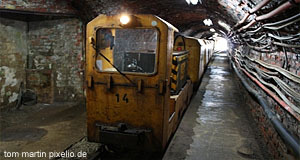 Today, Oberzeiring has some of Austria′s many show mines ("Schaubergwerk"), but one of the least crowded. Therefore, I confidently recommend a visit: Marvel at dark holes and tunnels and learn about the miserable circumstances in which miners lived and worked alongside with dogs that carried the quarried stone out of the mine. A skeleton of one of these dogs in on display. To domestic visitors, Oberzeiring is mostly known as a "Luftkurort" or "air cure town". The dry air of the mines is rich in minerals and people suffering from all sorts of fascinating lung diseases come to Oberzeiring to spend time in the "Heilstollen" ("Curing Mine"). Treatments are open to privately paying visitors, too, and you can give it a go yourself if you fancy. Beyond that, Oberzeiring has few attractions to offer: Stroll around the town and stop by the parish church. If you want to make the town more than a stop-over destination, you are probably keen on hiking. There are plenty of excellent hiking opportunities in the local area. The tourist information centre will be able to point you towards the most rewarding routes. Moving on the the village of Oberwölz, you can find another place that lived off silver and salt trade during the Middle Ages. Today, the village is rather tiny, but its well-preserved 14th century town walls tell the story of its ancient wealth. The parish church of Oberwölz has a Romanesque core with Gothic extensions. A 14th century hospital was later transformed into another church, the Sigmundskirche. In terms of sightseeing, other nearby attractions include the previously mentioned town of Judenburg, Murau, the church of pilgrimage in Frauenburg, and the amazing abbey of Seckau. If you are willing to drive a bit further, the amazing monastery of Admont and the Styrian parts of the Salzkammergut are within reach. Note that the metropolis of Unzmarkt is just south of Oberzeiring - this is home to one of my co-writers here on TourMyCountry.com. Unzmarkt is also an important railway hub.